A basketball court has symmetry; one half of the court is a mirror image of the other. The entire basketball court (see Figure 1) is 94 feet by 50 feet. On each half-court, painted lines show the free throw lane and circle, as well as the three-point arc, whose distance from the basket varies based on the level of hoops being played. Figure 1: The American court. Indoor basketball courts are almost always made of hardwood. Outdoor courts are most commonly composed of asphalt. Along the length of the court, the borders are the sidelines. Along the ends, the borders are the endlines, or baselines. 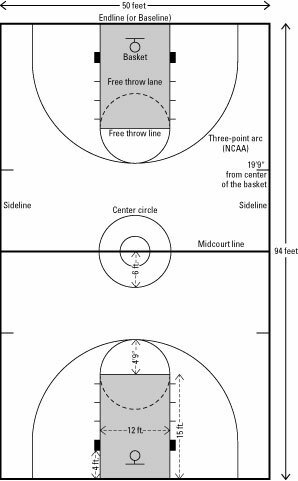 Separating both halves of the court is a midcourt line. In the very center of the midcourt line is the center circle (12 feet in diameter), where the center toss takes place to begin the game. The free throw lane is the hub of the action in each half-court. This rectangle is 12 feet wide — 16 feet at the men’s pro level. Its length, as measured from the basket to the free throw line, is 15 feet at all levels. An offensive player may not stand inside the lane for more than three seconds unless he or one of his teammates is shooting the ball. After a shot is taken, the count starts over again. A defensive player may remain inside the lane for as long as he desires. A player fouled by another player sometimes receives free throws, also known as foul shots. She takes these shots (they aren’t really “throws”) from the free throw line at the end of the lane — 15 feet from the basket. The shots are “free” because a defender does not guard the shooter while she’s shooting. When a player shoots a free throw, her feet may not cross the free throw line until the ball hits the rim, or else the shot is nullified. The remaining players line up alongside the free throw lane (or behind the shooter) and cannot interfere with the shot. They line up in order, on either side of the lane, of defense-offense-defense-offense. (Up to four players may stand on one side of the lane.) If a player opts not to take a spot (say, for example, the second defensive spot), then a player from the opposing team is permitted to step into that spot. The fans behind the basket usually scream, jump up and down, and wave their hands to try to distract an opposing team’s shooter during free throws. The three-point arc is the other important marked feature of the court. The arc extends around the basket in a near semicircle, and its distance from the basket differs according to the level of play. Even at one level, the distance can change as rules committees grapple with the best distance for the good of the sport. The NBA has changed the three-point distance on two different occasions since first adopting the trey, as the three-point shot is called, in the 1979-1980 season. The three-point distance was moved back to its original 23′ 9″ for the 1997-1998 season. The college distance is 19′ 9″, while the international distance is 20′ 6″. Any shot made from beyond this arc — even a desperation half-court shot at the buzzer — is worth three points. A three-point shooter must have both feet behind the arc as he launches this shot, but either foot is allowed to land on the other side of the arc. Thinking of the entire court as two half-courts, divide it into frontcourt and backcourt. The frontcourt is the half of the court where the offense’s basket is located. The backcourt is the other half. Thus one team’s backcourt is the other team’s frontcourt.